We’ve only seen Ricciardo neck a couple of shoeys this season and in some ways, that’s probably a good thing. Not only are shoeys a potential health hazard, but it turns out Ricciardo has some rather questionable habits when it comes to his socks. 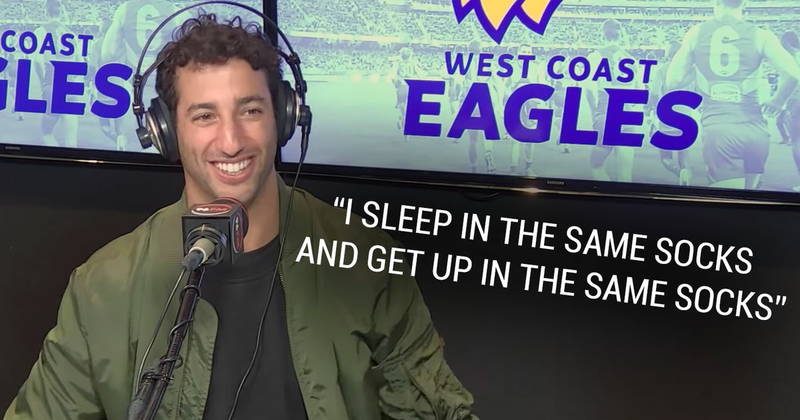 Appearing on the podcast for his favourite AFL team, the West Coast Eagles, he shared a rather disgusting story about his levels of foot hygiene (skip to the 38-minute mark for the sock story). We thought it was bad enough drinking champagne from a sweaty shoe that had done two hours of racing, but knowing that there’s a possibility that the flavours have been ‘enhanced’ by four days worth of old socks? No. Just no.